And finally! After months of planning, tweaking, learning graphics programs, and finally being smart enough to get Lori to do my photos, my first baby is ready for launch! Oklahoma started as a simple gift for the squadron commander’s wife. From that version, I reworked the bottom edge of the state until I was satisfied with the layout. Then…I wrote! It took a while to get everything right, and create the graphics, but I finally got the hang of it. I had two ladies from my guild test it. I read through it about a thousand times. I got the photos back from Lori and cried over how good they are! It finishes at 60x70” and uses fat quarters (or scraps!) So…if you live in Oklahoma or love someone who does, grab a copy! See also: Finish It Up Friday, Whoop Whoop, TGIFF, Needle & Thread Thursday, Finished or Not Friday, Show Off Saturday, Let’s Bee Social, Midweek Makers, Oh Scrap! Hey, and welcome to TGIFF! I'm Kate, the lovely person behind Katie Mae Quilts, and I spent most of the summer slacking off and waiting for the kids to go back to school so I could start sewing again. Well, you know what they say about the best laid plans, right? The second week of school, my oldest son was bit by a dog during cross country practice. It wasn't a terrible bite, but it wasn't a minor one, either. One of her teeth got in his leg pretty good, and I had to learn serious wound care. Which is way above my parenting paygrade. And don't even get me started on googling bone infections. So anyway, getting back into the quilting groove took a lot longer than I had planned. In fact, I finished this quilt...at 4 pm on Thursday. BUT! It is finished! My first finish since July! And...it's the exact same quilt as the last time I hosted TGIFF. What, were you all hoping for something new? I made the first version of Oklahoma for my squadron commander's wife's going away present, and I wasn't completely satisfied with the outline of the state. The panhandle was too short, the bottom was too fussy, and keeping the red-blue pattern was a pain. I wanted to try a second version to correct those things, and make it truly scrappy. 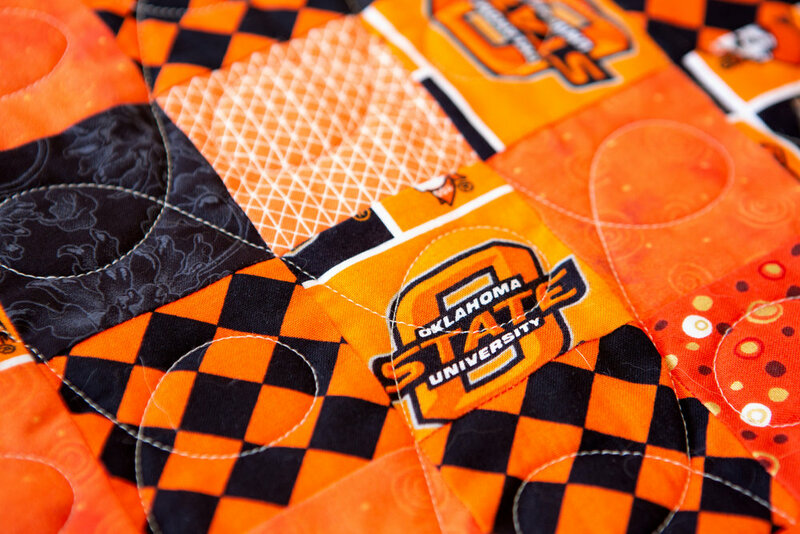 And I don't have a particular state university loyalty, but I wanted the quilt to reflect one of them. I sold baby burp rags at craft fairs the first time we lived in Oklahoma, so I had a decent stash of these oranges. It went together a lot faster without the fussiness, and I think this is a much better version of the state. So yay! I took a lot of notes along the way, and I'm hoping to turn it into a pattern very shortly. I did almost the same quilting - instead of the orange peel for the state, I just did the upsie-downsie loops across the entire quilt. Eliminating fussiness! Plus, I just love the design. I especially like the way it looks on the back. If you didn't know there was a grid on the front, you might be impressed with my longarm skills! The backing and binding are OSU fabric, the front is scrappy mix of OSU fabric, Cotton + Steel basics, and other random fabrics. Loads of gold metallic neutrals which is my new favorite. So I think all the kids across the nation are finally back in school. Does that mean it's time for the finishes to start rolling in? Or are you all now nervously checking your middle schoolers for dog gnawing potential? Link up your finishes here! Visit a few of the other finishes! Be inspired! Get creating!